PHILADELPHIA - Cory Schneider and Roberto Luongo are gone, but the goaltending position has not been forgotten by the Vancouver Canucks. With their second-round pick in Saturday's NHL draft at No. 36, the Canucks took the highest-ranked goalie on the board, Thatcher Demko, as new general manager Jim Benning begins the process of replenishing the organization's goaltending depth. "I believe you've got to have a succession of goalies coming through the system," Benning said Saturday afternoon. "Goaltending is the most important position in an organization. ... I believe to be a top, contending team in the league, you need good goaltending. You can never have enough good goalies." Benning believes Demko, who plays at Boston College, is capable of developing into a No. 1 goaltender. He immediately becomes the Canucks' goaltender of the future, especially considering the uncertainty that comes with Eddie Lack and Jacob Markstrom. "Hopefully there's an opportunity for me," said Demko, a native of San Diego, Calif., who brushed off the idea of pressure. "I think once I get there, you'll start to feel it a little bit more with the Canucks fans and how passionate they are." 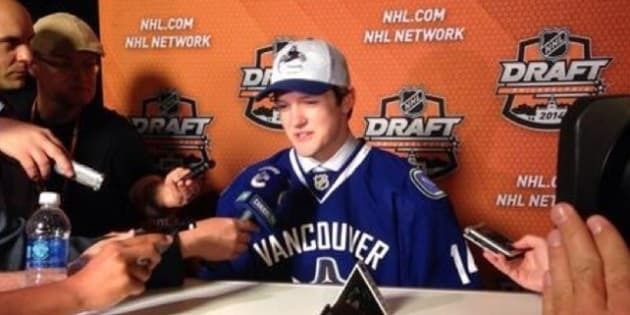 It was at last year's draft when ex-GM Mike Gillis traded Schneider — coincidentally also a Boston College product — to the New Jersey Devils for the ninth pick, which Vancouver used on London Knights centre Bo Horvat. Just before the trade deadline, the Canucks sent Luongo to the Florida Panthers for Markstrom and forward Shawn Matthias. Markstrom started just three games for the Canucks since the trade. Demko, who has the option of playing one to three more years at Boston College, isn't worried at all about the microscope that goalies are under in Vancouver. He can't wait to see what it's like to play in a Canadian market. "I'm going to thrive in it," he said. "You've got to play in pressure and that's kind of just the nature of it. You've got to thrive in those situations or you're not going to have success." Demko might get a taste of a pressure situation at the world junior championship because he's a candidate to start for the United States in the tournament that takes place in Montreal and Toronto. "Obviously you want to be the starter at world juniors, (it) is a goal," he said. "But there's a lot of other guys that could easily have that position." Part of drafting Demko was Benning's familiarity with him from living in Boston and watching him play often. The same can be said for winger Linden Vey, whom the Canucks acquired from the Los Angeles Kings on Saturday for the 50th pick. At 22, Vey has just 18 games of NHL experience and five assists in that time. But Benning watched him play with the Kings' AHL affiliate in Manchester and said he'll make the Canucks next season. "He's ready to play in the NHL now," Benning said. "He'll start out as a third-line guy. I think once he's up and going, maybe it takes a year, maybe it takes a year and a half but I think he's got the skill to be a second-line centre at some point." It doesn't hurt that Vey also played for new coach Willie Desjardins with the WHL's Medicine Hat Tigers. Derek Dorsett, acquired from the New York Rangers on Friday, also was in Medicine Hat with Desjardins. That No. 50 pick wasn't the Canucks' until they traded defenceman Jason Garrison to the Tampa Bay Lightning on Friday afternoon. The Kings used it on Victoria goalie Alec Dillon. Vancouver took six-foot-seven Russian defenceman Nikita Tryamkin 66th, Swedish defenceman Gustav Forsling 126th, Erie Otters centre Kyle Pettit 156th and Prince Albert Raiders defenceman MacKenzie Stewart 186th. Those players join the Canucks' youth movement along with first-rounders Jake Virtanen and Jared McCann. But the most intriguing addition on Day 2 was Demko, who has prototypical NHL goalie size at six-foot-three. "My size is a tool, but I don't like to rely on it," Demko said. "I can use it, but I still like to react to pucks and kind of play athletic. It's something I'm still working on, but it's one of the biggest pieces of my game." Demko isn't just confident in himself but also in his ability to withstand the heat in Vancouver. He grew up considering Martin Brodeur a role model but ultimately might want to get some advice from Luongo. "Hopefully I can appeal to the fans up there and make them love me instead of hate me," Demko said.